Okay, one last goodie from King David. Here's the perfect use for the empty cookie tin you have laying around after the holidays. 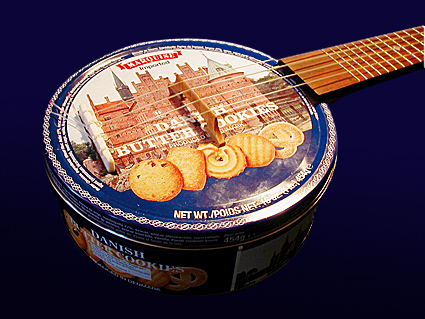 This guy (the mysterious "Voudi") uses buiscuit tins to craft "Kujuloulou's"--crosses between banjo and resonator ukes. 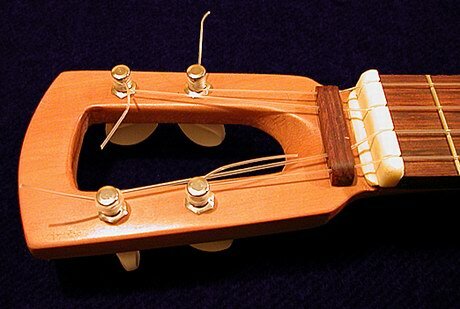 I'm particularly intrigued by the novel string guide he's added above the nut to keep the strings taut against his offset headstock design (see image, left). Link. Yet another here. Yummy! While you're in metal mode, check out these beautiful "Canukes", too.